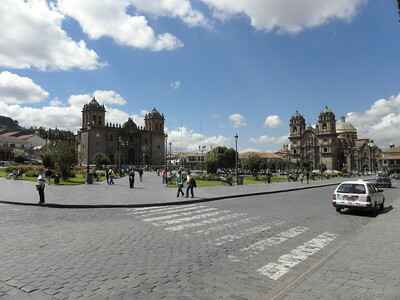 The City of Cuzco is the combination of the Inca capital and a Spanish colonial city. The Incas developed the city in the late 15th century, during the reigns of Pachacutec and Tupac Yupanqui. They aimed to create an ideal town, with administrative and religious functions in the center and agriculture and industrial production in the outlying areas. The first Spaniards arrived in the city in 1533. They constructed their own buildings (catholic churches, mansions) on the demolished walls of the Inca buildings, but left the city layout intact. These buildings are of Spanish influence with a mix of Inca architecture. I first arrived in Cuzco from Arequipa after the bustrip-from-hell: 17,5 hours, driving over mountain passes at night in the snow. Cuzco then appeared to me as a dusty and chaotic large city. I ended up spending 4 nights there in total, before and after my trips to Machu Picchu and Manu National Park. The city nowadays essentially is a transportation hub for the region. It certainly has its merits but I did not like it that much. In an hour or two you can visit the main sights of the historical center - the bling bling Cathedral, the disappointing Coricancha temple and the original streets. What is left of the Inca times are merely some walls and sometimes the street pattern. Maybe the impression would have lasted more if I had seen Cuzco before Machu Picchu and Ollantaytambo. Probably not included in the WHS are the Inca ruins of Sacsayhuamán. This is a walled complex on the northern outskirts of the city. It was used as a military fortress and had ritual functions as well. Its main defensive wall has an elaborate zigzag shape. It's a nice hike to get there from the city center, and the construction has been done as perfect as the Incas knew how to do it. 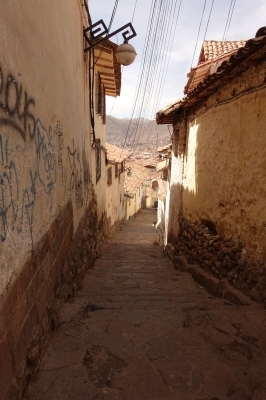 Cusco is a unique blend of a colonial city with the traditions of the Inkas. The colonial buildings often are set on top of Inka foundations and the city has a unique mountain feel to it. Personally, I enjoyed the San Blas Barrio the most which is tucked on a hillside to the North East of the historic city center. Cusco is also a pretty touristy place as it serves as hub for the area. You will find plenty of Western tourist amenities. For instance, Cusco was the only place along my trip I managed to take a Yoga class. For a Peruvian city Cusco felt comparatively dirty. I found both the central districts of Lima and Arequipa better upkept. In addition, the original Inka/colonial town layout is very narrow and illsuited for the amount of traffic the city nowadays has. This, though, is a problem Cusco shares with Arequipa and Lima. More pedestrian precincts would be a nice improvement. Cusco is well connected by both busses and planes to all parts of Peru and some parts of the world. Seeing the distances involved I would counsel to making use of the airport. From the airport you can either take a cab or a collectivo. The collectivo run directly in front of the exit. If you are a train aficionado there is also a train connection to Puno. Cusco may very well be your first stop on your trip above 3000m. As such altitude sickness may be a thing. In my case, I felt minor headaches from the minute I exited the airport terminal. Wandering around the city on my first day I was quickly out of breath. I can only strongly recommend to take it easy and take adequate pauses. If possible, come in via bus to help with the acclimatization or continue quickly to the Sacred Valley and Aguas Calientes/Machu Picchu as these are significantly lower. From Cusco you can travel on to Machu Picchu and the Manu National Park. For Manu please be advised that no tour from Cusco lasting only three days will take you to the core zone. The core zone tours last longer and cost significantly more. For Machu Picchu you need reservations for both the site as well as the trains. In off season (Oct to May) this may well be possible at short notice (within a week). If you don't mind spending a bit extra, using a travel agency in Cusco to do all the bookings for you may be worthwhile. Cusco was also the nexus of the Qhapaq Nan. By venturing a bit further North you can find a remaining part of the road system. Start at the Templo de la Luna and Chukimarka and follow the trail direction Yuncaypata. You will see a big sign with a map and an explanation at the beginning of the trail. This can be well combined with a visit to Sacsayhuamán which is fairly close to the start of the trail. The Sacred Valley holds many great sites. The terraces at Pisac, the fortifications at Ollantaytambo or the salt mines of Maras are unique and well worth exploring. To me this would warrant at least a serial inscription as cultural landscape, if not several individual sites. In Pisac save yourself the cab and hike up and down. On your way up try to stick to the right hand side and pass through the amazing terraces. On your way down follow the steep mountain ridge. Finally, you can move on to both Arequipa (bus, plane), Lima (bus, plane) and Puno (bus) for Lake Titicaca. When transferring to Puno I would recommend the tourist busses with multiple stops along the way. The Church of Andahuaylillas is a spectacular example of Barroco Andino and I feel that this could be another inscription. Another stop is Raqchi, a site of the Qhapaq Nan which runs right through it. Upon entering the site head to the site map and you will see a clear demarcation of where the Qhapaq Nan runs. I referred to Cuzco as Cusco as it's the current town name. I am not sure why Nazca/Nasca uses the new town name and Cuzco/Cusco the old one. 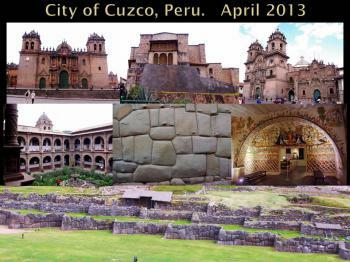 I have spent 6 month in Peru, in 2013. The city of Cuzco is undoubtedly of the most astonishing treasures of the country. It was the capital of the Inca empire. It embodies the association between the Inca culture and the colonial influence. 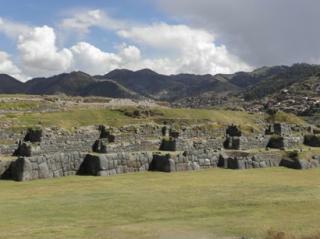 Inca are present through the impressive walls that survived eathquakes, the layout of the city, the Temple of the Sun (combined with Santo Domingo church buildings) and the Sacsahuayman fortress above the city. Colonial architecture can be seen through the magnificent cathedral, churches, convents and secular building. Some of the religious buildings are fine examples of colonial art and real masterpieces, notably the Cathedral, Church of la Merced, Santa Catalina and the Iglesia de la Compania. Wherever you go in the ton you can be amazed by the traditional buildings, huge monuments and typical landscapes. Altitude and cold can be surprising so prepare yourself. The high-elevation of Cuzco will become apparent as soon as you walk up some stars. 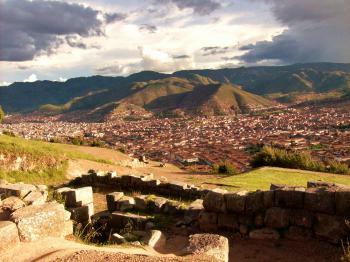 The city is beautiful, impressive Inca ruins dot the landscape in and around Cuzco. The sense of history and the past resonates strongly as you walk the streets of Cuzco, where Inca streets and structures still exist, though by in large Spanish buidlings were long ago built on top of them using Inca materials as the foundation. When I travelled here, we were lucky enough to arrive during festival time, men, women, and children dancing in the streets and playing music. Overall a wonderful experience. I do not include Sacsayhuamán here. While its strange that its not included in the City of Cuzco WHS or the Qhapac Nan WHS, I hope it might be nominated individually as its own WHS in due time. Very interesting city with great food and extraordinary art and churches. Plan a day for the city along and extra for the surrounding ruins. You may have altitude sickness problems. The city was more interesting than expected and I wish I had scheduled extra time. Mummies: "Royal Mummies" kept at Cuzco were all destroyed by the conquistadores. Cuzco museum still has other mummies. Holiest place: The Temple of the Sun was holiest place for the Inca. Mercedarians: in 1534, Father Sebastian de Castaneda founded the convent of Cuzco, the capital city of the Incan Empire, which would soon become a major evangelization center from which frequent missionary expeditions would leave for more remote areas. Tintin: The Seven Crystal Balls / Prisoners of the Sun.